1Research Scholar, Department of Pharmaceutical Science, JNTUH, Hyderabad, Telangana, INDIA. 2Department of Pharmacognosy, Anurag Pharmacy College, Kodad, Telangana, INDIA. Objective: To evaluate the cerebro protective effect of Dalechampia indica (DI) ethanolic (EDI) and chloroform (CDI) extract fractions against cerebral ischemia- reperfusion insult in rats. 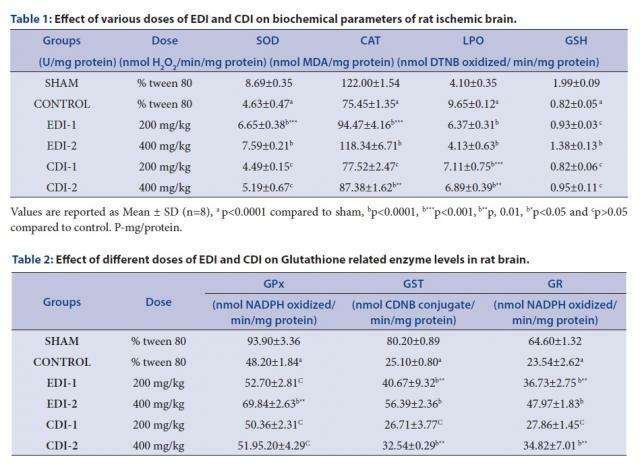 Method: The rats were treated with different doses (200 and 400 mg/kg) of EDI and CDI orally once daily for 30 days. After completion of pre-treatment, ischemia was induced by blocking bilateral common carotid arteries (BCCAO) for 30 mins followed by reperfusion and ferric chloride induced thrombosis. The post treatment was continued for another week after surgery. The behavioral parameters were assessed and finally, rats were sacrificed to isolate the brains to estimate biochemical parameters. Results: Combination of global (BCCAO) and focal (Thrombosis) ischemic model along with reperfusion has induced prominent ischemic insult indicated by antioxidant enzymes depletion and elevation of lipid peroxidation. Pre-treatment with different doses of EDI and CDI significantly improved the levels of superoxide dismutase (SOD), glutathione enzymes (GPx, GSH, GST, GR), catalase (CAT) and decreased the lipid peroxidation. Conclusion: Results established Cerebro protective role of Ethanolic extract fraction of DI in cerebrovascular insufficiency states and cerebral ischemic-reperfusion injury produced by bilateral common carotid artery ligation along with reperfusion and thrombosis which may attribute to presence of alkaloids,flavonoids, and phenolic compounds. Srinivasula S, Maram CE. Effect of Dalechampia indica Wight Extract Fractions on Behavioral and Biochemical Abnormalities following Ischemia-Reperfusion Insult in Rats. Pharmacognosy Journal. 2018;10(1):39-44.